The S3 sedan's 2.0-liter turbocharged engine makes 300 hp, propelling the car from 0 to100kph in 4.9 seconds. With the 300-hp S3 sporty variant, Audi gets a flagship for its range of A3 sedans. The automaker believes the sedan range will become the A3's best-selling body style, accounting for more than 50 percent of total volume because of strong anticipated demand in markets where sedans are popular. How fast is the S3? It accelerates from 0-100kph in 4.9 seconds when using the Launch Control function available with the S tronic 6-speed dual-clutch transmission. The 300hp 2.0-liter, gasoline direct-injection turbo engine delivers a very sporty power-to-weight ratio, helped by the car's light weight at 1430kg. The S3 is one of the first models in Europe to offer an on-board high-speed LTE data connection. 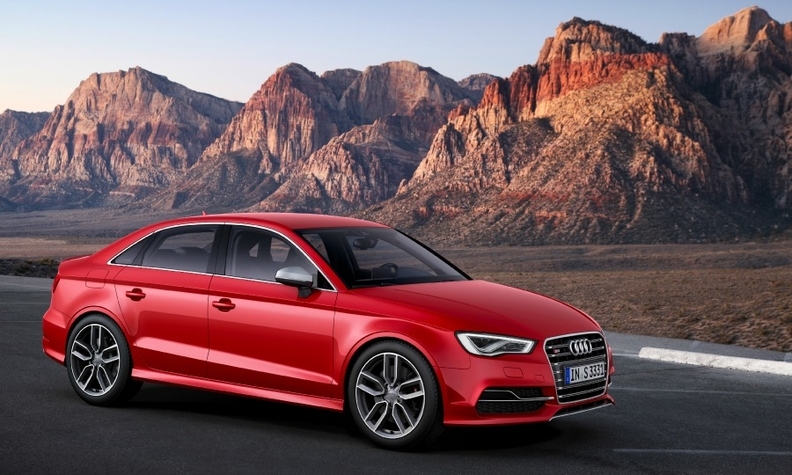 The S3 can only be bought with Audi's Quattro permanent all-wheel-drive system to help the driver handle the 300 hp. Just one: an all-black interior including the standard inlays in matt brushed aluminum. "We see a lot of potential in China and the United States, and some potential in Europe," Audi CEO Rupert Stadler told Automotive News Europe. The added sales are supposed to help Audi reach its goal of overtaking BMW as the world's top-selling premium carmaker. Currently, the five-door Sportback is the top-selling A3 body style, accounting for 60 percent of the range's volume, but this share will decline as the sedan rolls out globally. Audi began delivering A3 sedans to customers last October. The S3 debuts next month in Europe. Stadler said the A3 sedan impressed him at first sight. "Since I saw the first sketches and later the first clay model, I was sure it would work," he said.